If you haven't read it, it's still news! 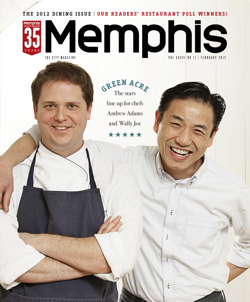 We told you about the cover story on ACRE in the February food issue of Memphis Magazine when it came out weeks ago. But if you haven't read it, don't worry! Thanks to the staff of Driscoll Design Group, here's a nifty PDF file of the whole article you can download and read. Or you can read the article online here. "Andrew Adams and Wally Joe lead a collaborative team of experienced chefs at ACRE, who use seasonal ingredients to spin innovative dishes from a wide range of familiar foods, such as Truffle Studded Chicken with charred cauliflower, golden raisins and red-wine-truffle sauce"